3 versions of Strada-Sphere Radio! 1) The Strada-Sphere Radio Stream hosted by SoundClick.com. This is where it all started!Available 24 hrs a day and featuring uninterrupted Stick music from SoundClick Artists offered in both Hi Fi and Lo Fi.Click and listen now! We just added more Stickists to the stream! 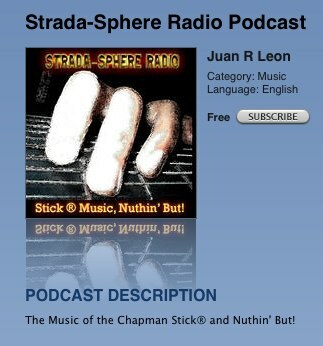 2) The Strada-Sphere Radio Podcast.a 30-45 (or more) minute show. Head on over to the Strada-Sphere Radio Podcast Blog to find out more. 3) Now we have a show in Spanish! Listen to current and past shows using the Big Contact player at the top of the page,complete with show notes and links, or you can launch a separate Pickle Player window using the button below.This will allow you to surf away from the site and still enjoy the podcast.Just remember to disable any Pop-Up blockers. Got i-Tunes? Subscribe by clicking the graphic above!